Meet with an academic advisor to plan your schedule. 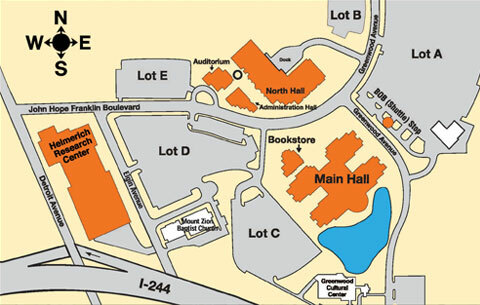 Tour the campus to learn where your classes and important services are located. Submit documentation to establish services with Disability Services, if needed. Set up your O-key account. Submit your FAFSA. Use school code 003170. Find out what programs are offered, what transfers and what to take at your current institution. Learn about admissions requirements, important deadlines and how to apply. Explore future scholarship and financial aid opportunities available to new transfers. Learn about in-person, online and hybrid class formats. Get a feel for the OSU-Tulsa campus during a tour and learn about opportunities available to you as a student. Get a copy of your college transcripts and bring them with you. Pre-register for Transfer Day and we'll be expecting you. Walk-ins are always welcome. Admission, Advising, Financial Aid and Enrollment Services offices will close promptly at 1 p.m. for lunch. Students who arrive after 12:30 p.m. may not be seen until 2 p.m. depending on the student traffic for each advisor. The Prospective Student Services offices will remain open between 1 and 2 p.m.
Students may also visit advising and admissions counselors during regular business hours from 8 a.m. to 6 p.m. Monday through Thursday and 8 a.m. to 5 p.m. on Friday. Visit the OSU-Tulsa Advisement Services website or call 918-594-8271 to schedule an appointment.